“Going Green” is a popular statement these days. We all know how important it is to keep our planet clean and conserve resources. Then, there’s the #GlobalGreening campaign powered by Tourism Ireland. It’s the massive campaign behind major landmarks across the globe turning green. But was I ready for the most interestingly green week I’ve had so far in the office? Luckily, I made sure to have this week well-documented so I’d have evidence to bring back home for the folks across the pond. You’d have to see this to believe it! With the 17th of March behind us now, I’m hoping things can go back to normal (i.e. my colleagues having a natural skin colour). I’m also hoping the shamrock suits go away since it’s pretty distracting in the office when I can’t stop looking at such a beautifully crafted green business suit designed for “the craic”. 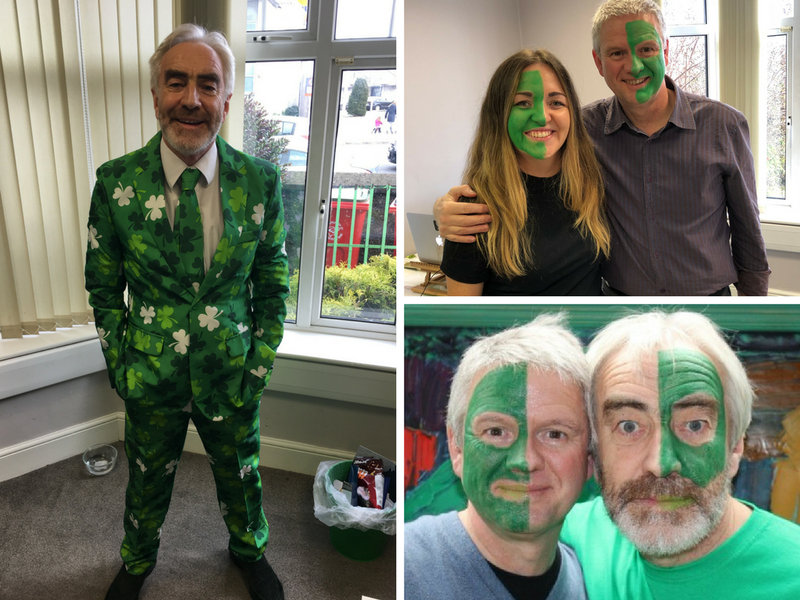 Now that I have St. Patrick’s Day at the SoolNua office under my belt, I can mentally move on from that whole experience. Sure, I did learn things like how long it actually takes for face paint to come off but I’m excited to get back to the regular work grind. Most importantly, I can finally stop distracting myself with wondering if I should buy a one of my boss’s amazing shamrock suits for myself. Want to chat about digital marketing, content, or do you know where I can buy a quality shamrock suit? Send me an email at [email protected]. I’d love to hear from you.